Fall is quickly approaching, and although I love the warm weather that summer brings, I am more than excited for fall fashion! I love scoping out the latest trends for upcoming seasons, and I’ve already fallen in love with one of fall’s hottest (and warmest) offerings: the moto jacket. This timeless piece will add some serious edge to your outfit! Although they’re cute, I think I’m most excited about the fact that they look so warm! 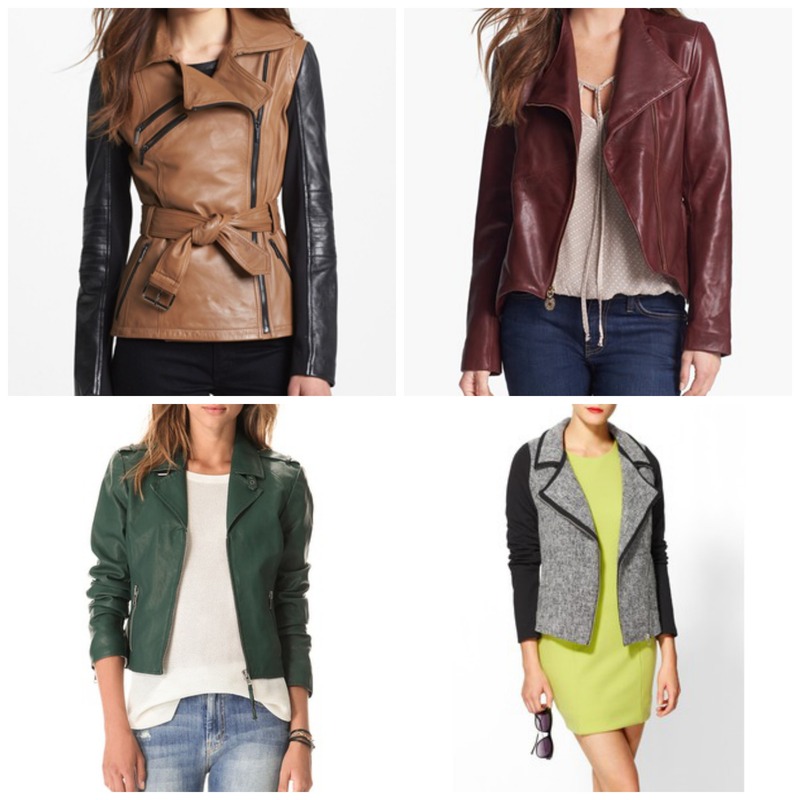 Another reason I’m loving the moto jacket is that there are a variety of options. While the majority I’ve come across are leather, I’ve also found a few gorgeous knitted options. In addition to the varying materials, I’ve also found a moto jacket in just about every color imaginable. The two-toned versions with brown and black are my favorite so far! Add some skinny jeans and booties, and you have the perfect fall outfit! They’re on my wish list for fall! Crazy about the laundry one! So cute! Same here! I’m slightly obsessed! I love that they’ve decided to keep this trend long-term. There are certain fashion trends I’m glad to see go but not this one! I’ve always loved biker-type jackets. Me too! I like how they don’t seem too constricting, either. Great selections! The color of that Tahari one is gorgeous! Thanks, Stephanie! I love the color of the Tahari one! I ADORE the Laundry one..of course it is wayyy out of my budget :/ I love this post though! Great finds! Hopefully it’ll go on sale soon, because it is seriously amazing!